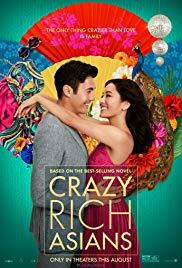 A romantic comedy that follows native New Yorker, Rachel Chu (Constance Wu), to Singapore to meet her boyfriend's family not realizing that they are not just rich, but CRAZY rich! This film has taken some hits from haters because of the title, but this film could be called "Crazy Rich Greeks" or "Crazy Rich Brits," because it's not about rich Asians who are crazy, it's about people who are so rich they are CRAZY rich. And that is not just an Asian thing. And the themes of this story are not just Asian themes. Fish-out-of water, family traditions, class and financial differences, jealousy, obstacles to love - these are all human experiences and emotions that transcend nationality and are relatable by everyone. You don't need to be of Asian descent to get this film and enjoy it. The film has also taken some hits for not highlighting a typical Asian experience but no movie tells everyone's story. Speaking of hits, this film has become a big hit of the summer and shows that there is a market for movies with an all Asian cast, something we haven't seen since "The Joy Luck Club." Rachel Chu is a Chinese American and a professor of Economics at New York University. She was born in the United States and raised in modest circumstances by a single mother who immigrated from China. Rachel is in love with Nick Young (Henry Golding), who is also a professor but who was born in Singapore and raised in London. But despite being raised in different countries, Rachel thinks that Nick is just a regular guy until Nick invites Rachel to travel to Singapore to attend his best friend's wedding and to meet his family and she learns that Nick's family is not just rich, they are CRAZY rich as in one of the top ten richest families in Asia. Nick is not just a regular guy. He is rumored to be in line to inherit it all. Rachel also learns that there is a great divide between being as Asian-American with an immigrant mother and an actual Asian, and Nick's mother, Eleanor (Michelle Yeoh), a controlling woman who is not happy about Nick having an American girlfriend, makes that very clear to Rachel. But Rachel is optimistic and tries to make it work...until it doesn't. Because Eleanor is going to be damned if her Nick is going to marry an American with no money or status. The film also tells a side story about Nick's cousin, Astrid (Gemma Chan), who is considered one of Asia's great beauties but whose marriage is in trouble because her husband, Michael (the hunky Pierre Png), is also a bit of an outsider and is troubled and insecure about his wife's wealth, a possible hint of what Rachel may have to deal with one day if she marries Nick. We also get to know Rachel's friend, Peik (the hilarious Awkwafina), who attended school with Rachel and who also comes from a rich family in Singapore, but her family is not CRAZY rich, though they are decidedly crazy, and they are new money which doesn't carry quite the cache as Nick's old money. Even Peik is impressed with Nick's family's wealthy and prestige. Peik and her Mom, Nina's (Chieng Mun Koh) and Dad, Wye's (Ken Jeong) over-the-top extravagant lifestyle (Nina has a gold toilet like Donald Trump's) and Americanisms are the comic highlights of the film. While Nick attends a bachelor party, Rachel is invited to the Bachelorette party where she meets Amanda (Jing Lusi), one of Nick's ex's, who pretends to befriend her but who plans to make Rachel's stay a nightmare and it becomes clear to Rachel that she doesn't fit into this world. This is your typical boy gets girl, boy loses girl, and after several twists and turns, gets girl again, but despite the fact we have seen movies like this many times before, the all Asian cast, the setting and the charisma of the actors saves it from being just another rom-com. And it's not. In fact, it's a great rom-com, the likes of which we haven't seen for a long time. It reminded me of "Pretty Woman." It's that good. I loved it. Written by Peter Chiarelli and Adele Lim (based on the books by Kevin Kwan) and directed by Jon M. Chu, this is a much-needed, delightful romantic comedy that has everything you could want from a rom-com: good-looking charismatic lovers, some villains, some comedy, some drama, and some sentiment that will have you reaching for a hankie. And an all-Asian cast is a welcome addition to the genre. Constance Wu is probably best known for her role in the TV show "Fresh off the Boat." This marks her feature film debut and I predict more romantic leads for her. Likewise, Henry Golding is a newcomer, more known for being a presenter on British TV than an actor, but after this film I predict he will be in high demand. He is one handsome guy. Michelle Yeoh is the veteran, having been an international star since the 1980's - "Crouching Tiger, Hidden Dragon" - but no sword fighting here, just looks that could kill. She lives up to her acting cred. And Awkwafina and Ken Jeong are also outstanding for the humor they bring. This film is romantic and fun but it's also important, not just for its Asian cast, but for the strong women characters and mother-daughter relationship. Rosy the Reviewer says...one of my favorite films of the year. Don't miss it. I even cried at the end. 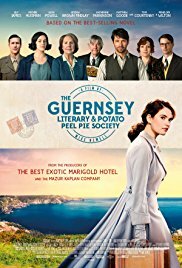 During the Nazi occupation of Guernsey Island in WW II, an unlikely motley crew form a book club to outsmart the Nazis, and years later, Juliet Ashton (Lily James), a young writer, travels to Guernsey to find out more about this unique club only to discover some sad secrets. During the Nazi occupation of Guernsey Island during WW II, four Guernsey friends - Elizabeth McKenna (Jessica Brown Findlay), Eben Ramsey (Tom Courtenay), Isola Pribby (Katherine Parkinson) and Dawsey Adams (Michiel Huisman) - are discovered out after curfew by some Nazi soldiers and must explain themselves. Thinking quickly, The Guernsey Literary and Potato Peel Pie Society is thought up on the spot. You see, the Nazis were animals but they had a thing for culture and had encouraged the populace to pursue cultural activities, so the four were given a pass and their cover allowed them to get together on a regular basis where they actually did discuss books. But more than that, it was a few hours when they could all forget their troubles. The four had not all known each other very well. Elizabeth was their connection and it is Elizabeth's story that forms a major part of the plot. Fast forward to after the war. Juliet Ashton is living in London and writing and promoting her books. They are lighthearted affairs and she is looking for something more serious to write about. Out of the blue, she receives a letter from Dawsey Adams, a complete stranger to her and learns that he is a member of a curiously named book club - The Guernsey Literary and Potato Peel Pie Society. Intrigued she plans a trip to Guernsey to write an article about the Society for The Times. Juliet is also working on some past emotional issues and has an American boyfriend, Mark (Glen Powell), who has just proposed and wants to take her to New York. He doesn't want her to go to Guernsey but she perseveres. She wants to travel to Guernsey first and find out about this strange book club. When Juliet arrives in Guernsey, she meets Dawsey, Eben, Isola and Amelia Maugery (Penelope Wilton) along with young Eli (Kit Connor), Eben's grandson, the current members of the Society. Elizabeth, who founded the group, is no longer in Guernsey and we soon learn why. The drama turns to mystery as Juliet tries to discover what happened to Elizabeth. And by the way, for those of you not immersed in British geography, Guernsey is part of the Channel Islands and yes, they are in the English Channel, just so you know. Watching this film, I decided I had to go there because it was so beautifully quaint but I learned that ironically the movie wasn't filmed there. It was actually filmed mostly in Clovelly, Devon. AND I'VE ALREADY BEEN THERE! 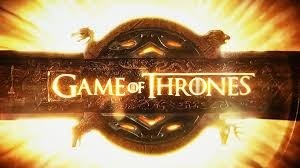 Through the course of her visit, Juliet learns what happened to each member of the group during the war, how the Society got its name and we get caught up in these people's lives and eventually find out what happened to Elizabeth. We also find out what happens to Juliet's engagement, something you will see coming a mile away. 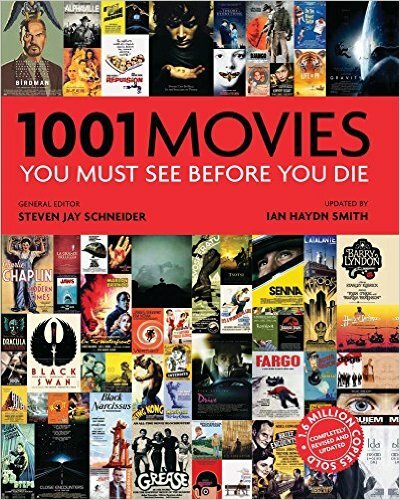 The Society provided "a private freedom" for the group and in addition to the old-fashioned story telling, this movie celebrates the power of books and reading. My mother always told me that if I read books I would never be alone and she was right. "Downton Abbey" fans will recognize both Lily James and Penelope Wilton, but if you are a fan of British TV and films, you will also recognize Tom Courtenay and other familiar British faces. James has made quite a name for herself since "Abbey," in the last three years having starred in "Cinderella," Mama Mia! Here We Go Again," "Darkest Hour," and "Baby Driver," all high profile films. And that's no surprise as she has a sweet warmth and beauty that exudes from the screen. She was destined to be a star. Directed by Mike Newell who also directed "Four Weddings and a Funeral" and one of the Harry Potter films among others, this film was adapted from the novel by Annie Barrows and Mary Ann Shaffer and is a delightful film. My only criticism is that I wish the characters had been more developed. I didn't feel I really got to know them very well. Rosy the Reviewer says...if you are a fan of British romantic comedies with a literary bent, you will love this film. A driven career woman is jilted at the altar and decides to take her honeymoon anyway - with her estranged father. Kristen Bell plays Rachel, a workaholic, who works right up to the moment of her wedding only to have her husband decide he can't handle marrying her when her cell phone falls out of her bouquet. So he bails. But since she had already arranged to take two weeks off for her honeymoon cruise she decides to go anyway. In the meantime, her estranged Dad, Harry (Kelsey Grammer), is in the audience at the wedding and the two spend a drunken evening reconnecting. Nothing like a little boozy evening to reconnect. And guess what? When she wakes up, she is on the cruise ship --- WITH HER DAD! She is not happy. When you are drunk, you make bad decisions. Turns out he wants to reconnect, and she doesn't, so they plan to get off in Jamaica but then they meet their table mates - a gay couple, a black couple and an old couple - and they all start to bond. I guess that's what happens on cruise ships. Rachel also meets Jeff played by Seth Rogan, and his being in this film makes sense since this film was written and directed by Rogan's wife, Lauren Miller. Jeff is on the cruise with his sister because his wife has just left him and his sister wants to cheer him up. Gee, I wonder what's going to happen there. It's all very predictable but there is a reason why Kelsey Grammer had a hit TV show. There is something about him that is compelling (even though I have a hard time forgiving him for cheating on and mistreating his ex-wife Camille, who I have come to know and like on "The Real Housewives of Beverly Hills." Don't judge.) And I like Kristen Bell. She is a charming young actress who brings a sunny personality to romantic comedies. Though the film's heart is in the right place and wanted to say something about family relationships - estranged father and daughter find each other again - the film didn't really get there. "Yesterday is the past. Tomorrow is the future. Today's a gift. That's why they call it the present." Awww. Isn't that cool? I will remember that one. Rosy the Reviewer says...a bit of fluff that tries to say something about family relationships but doesn't really say anything new though there are some fun moments. An unhappily married couple try to save their marriage on a trip to Naples. When I was having marital troubles, I sought counseling and my therapist warned against going on a vacation to try to save the marriage. It has something to do with suddenly being alone with your spouse, away from life's busy distractions and realizing you really don't like each other anymore. We're alone...now what? But how many times do married couples think they can save their marriage by going on a vacation? And how many movies have we seen where couples put their marriage to the test and after many twists and turns discover how much they really love each other? This genre is sometimes called the "comedy of remarriage," but here director Roberto Rossellini manages to avoid the cliches. 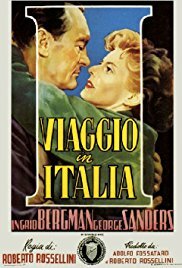 Katherine (Ingrid Bergman) and Alex Joyce (George Sanders) are on their way to Naples to take possession of a villa that Katherine has inherited from her Uncle Homer. During their road trip they share banalities but their faces disclose their unhappiness and boredom with their marriage, a scene that embodies something I so admire in films - let the pictures tell the story. In wonderful films with great actors, things don't need to be spelled out for the viewer to understand what is happening and Rossellini does that very well in that small scene. These are two people who are not used to being alone together anymore and who have become bored with each other. Eventually Katherine says that this is the first time since they married that they had been totally alone together and Alex replies, "Yes, I guess it is." Then total silence...crickets. When they arrive at Uncle Homer's house, we see that it is a palatial estate with a view of Vesuvius and in a small scene we see the clash of cultures and upper class vs. the lower class servants when Alex goes in search of more wine. But we also see where this marriage has gone as the two communicate through short blasts of sniping rather than trying to understand one another. So the two decide to spend some time apart on this trip. Katherine drives herself to Naples to tour museums. During those drives she talks to herself and we see that she doesn't like Alex very much. Alex's interests lie more with flirting and night clubbing, which doesn't go down well with Katherine, and when Katherine talks about an old boyfriend that doesn't go down well with Alex, either. These two may be bored with each other but that doesn't mean they want someone else to have them. As time goes by, communication deteriorates and the marriage flounders and finally the two tell each other what they don't like about the marriage. It looks like they will divorce until the two tour an excavation site at Pompeii and they observe the excavation of two bodies that look like lovers entwined and there is an epiphany. The bodies were lying in each other's arms when Vesuvius struck Pompeii. Life is short. Rosellini was married to Bergman and their getting together was a huge scandal when she left her doctor husband and children to run off with Rossellini in the 1950's. It was such a scandal that she was castigated on the floor of Congress and forced to stay in Europe for many years. In this film, you can see how fascinated Rossellini was with her by how he filmed her. But one can't help but wonder if this film was also a commentary on the Bergman-Rossellini marriage four years in. Bergman was a beautiful actress but it was her luminousness and vulnerability on film that made her special and why she starred in some of the most iconic films of Hollywood's Golden Age. She literally glowed and oozed off the screen. George Sanders was the consummate dapper dandy and cad. Who can forget him in "All About Eve" putting the moves on Marilyn Monroe? His character in films was always the same - smooth, suave, debonair, sophisticated, often villainous, and just so jaded and bored. In fact, in 1960 he published his memoirs - "Memoirs of a Professional Cad." He killed himself in 1972 leaving a suicide note that read in part: "Dear World, I am leaving you because I am bored..." Ironically, in this film he yet again plays a bored sophisticate. "I've never seen bored and noise go so well together," says Alex. Nobody did bored like George even at the last moments of his life. ---"1001 Movies You Must See Before You Die." Rossellini is one of the greats of Italian neorealism in films and he has allowed me to save face when it comes to my film cred. With my disliking Godard and Bresson, Rossellini's French contemporaries, I feel redeemed by my loving Rossellini's films. Maybe I just get the Italians more than I get the French. Rossellini's films are dark and existential, but there is always that glimmer of hope. Maybe that's why I like his films so much. The film is also very much a love letter to Italy, almost a travelogue and history lesson as Katherine tours the museums and countryside. The statues seem almost alive and, even though the film is in black and white, the countryside is so beautiful and vivid it almost looks like fake backdrops. Rosy the Reviewer says...a wonderful portrait of a troubled marriage and Post-war Italy. It's also a 1950's film that holds up very well today. The film may have been made in 1954 but the emotions it evokes are very present day. Nellie is the soon-to-be wife and Vanessa is the jealous ex-wife. Or are they? This is one of those novels where I can't tell you very much because it will ruin the twists. Let's just say that nothing is as it seems. In the first part of the novel, we get to know Vanessa who is divorced from Richard and not taking it very well. She lives with her Aunt and drinks way too much. She seems to be obsessed with Richard's soon-to-be-new-wife, following her around and calling her. She comes across as the jealous ex-wife. Then we meet Nellie who is about to marry Richard, who seems to be the perfect, sensitive, caring and considerate man. She is a preschool teacher and a waitress and Richard and she met on a plane. She is young and beautiful but also insecure. She has her own issues and a mysterious past. These two stories are told in alternating chapters. But remember what I said? Nothing is as it seems. In the second part of the novel, we get more background on Vanessa; we find out why Vanessa is so desperate to contact Richard's new bride-to-be; and what Richard is really like is revealed. Rosy the Reviewer says...assume nothing in this page-turning thriller. 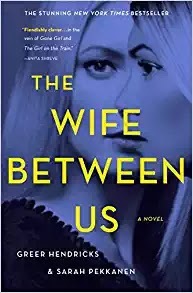 It's all very "Gone Girl," so if you really liked that book, you will really like this one!